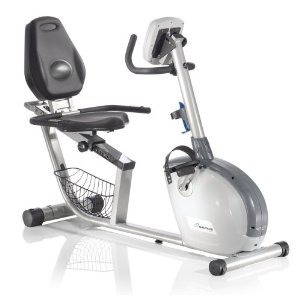 Quality features combine to make the Nautilus R514 recumbent exercise bike an excellent choice for a budget cardio machine. You will consistently find happy owners who give these bikes high marks for comfort and reliability. With 7 profile courses and 2 programmable user profiles to customize, you can work out to goal setting programs or set your own course. There are 17 program options in all, including four Polar heart rate workouts, Fitness Test, Distance Goal, Calorie Goal, and more. The Nautilus R514 recumbent exercise bike has a mileage indicator on the display that can be switched to kilometers if desired. UPDATE: The R514 has been replaced by the all new R614 model. 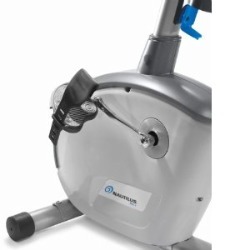 Check it out as well as other popular Nautilus exercise bikes on sale now at Amazon. Consumer reviews have been great on this model. It is affordable, attractive, effective, and has proven itself to be a solid performer. Everything feels firm on this unit; no wobble on the frame nor on the thickly padded seat with back lumbar support. The Nautilus R514 is extremely quiet too as it features a frictionless Eddy Current Brake (ECB) with up to 20 levels of resistance. 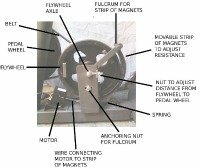 The 20-lb flywheel is about as large as they come on a sub-$500 machine (in comparison, the Horizon budget model has a 10-lb flywheel). The Nautilus R514 recumbent exercise bike offers a 300-lb max user weight, blower fan, console angle tilt, an adjustable seat, oversized deluxe pedals, rear stabilizer frame levelers, water bottle holder, reading rack, storage basket, and transport wheels. For cardio conditioning, the R514 also comes with a compatible Polar wireless chest strap (fits all sizes) as well as grip sensors on the handlebars next to the seat. You can use the telemetry feature for the Heart Rate Control programs, or periodically check your pulse rate throughout your exercise session. The heart rate monitor displayed on the console is not always accurate but this should not raise any red flags against this product since most HR monitors on cheaper equipment are unreliable. What you want in a budget bike is a solid frame, quiet magnetic flywheel, and quality construction for a reasonable price. You get that here. 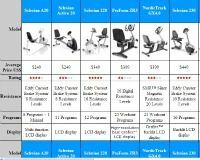 The Nautilus R514 recumbent exercise bike offers all of that which is why it rates a Best Buy at $460.